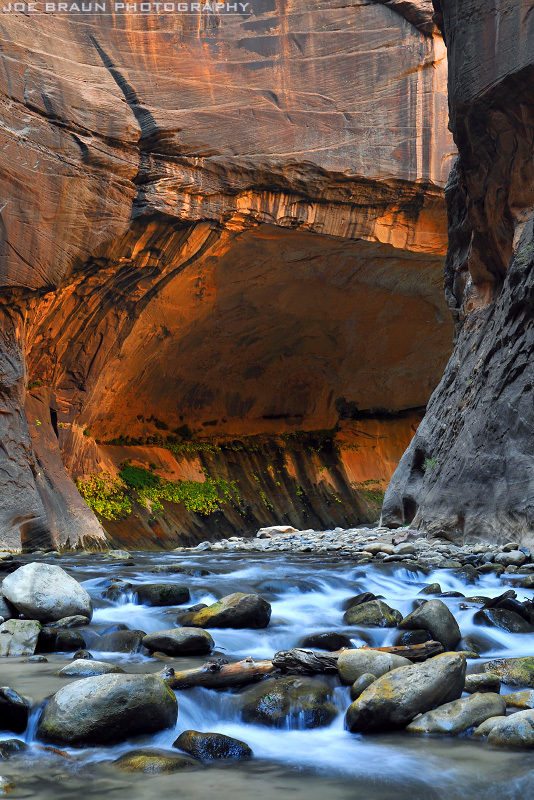 The granddaddy of desert slot canyons, The Zion Narrows has been rated one of the top ten hikes on Earth, and rightfully so. Leaving the pavement of the popular Riverside Walk, the Virgin River becomes the path, drawing you up into its towering walls and sinuous path along river banks and knee-deep waters into the narrowest section of Wall Street where 18 million years of river erosion has cut 1500-foot walls into the earth. For many, hiking The Narrows is a life-changing experience. 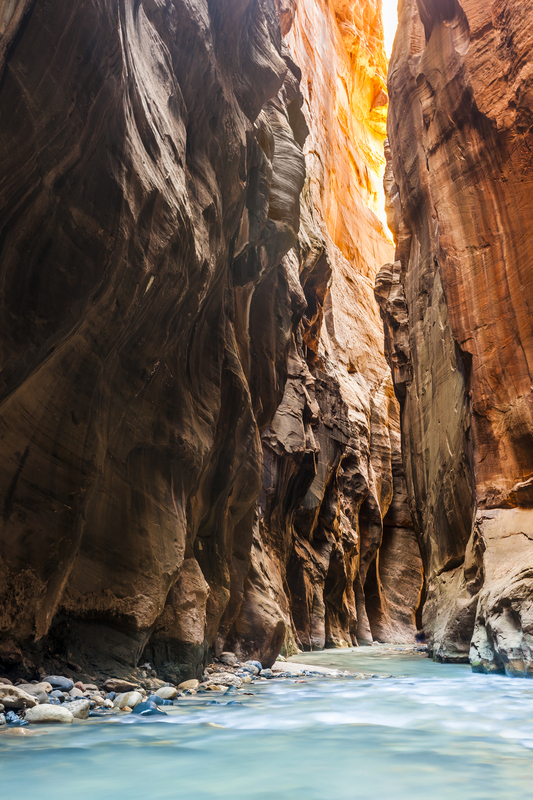 You can hike The Narrows, and we can help you. Bottom-Up Zion Narrows Day Hike – Hike in and out from the Temple of Sinawava via the Riverside Walk to Wall Street and back. Top-Down Zion Narrows Day Hike (One Day) - Hike the entirety of the canyon (17 miles) in one day from Chamberlain’s Ranch. Shuttle and permit required. Top-Down Zion Narrows Backpacking Trip (Overnight) - A more leisurely way to hike, enjoy, photograph, and explore. Depart from Chamberlain’s Ranch. Shuttle and permit required. The flow rate of the Virgin River is metered and at certain flow rates your experience will vary, and at some flow rates, the river is actually closed by the Zion National Park Service. At flows of 150 CFS (cubic feet per second) and lower the river is accessible to Bottom-Up hikers. At flows of 120 CFS and lower, the Top-Down Narrows is considered safe to hike. To see the current flow rate, click here. This chart is designed to help determine how the actual river flow will effect your potential Narrows hike. Difficulty: Easy to Moderate - Depending upon river volume and desired round-trip mileage. Where: Begin at the Temple of Sinawava and Riverside Walk. When: Highly dependent upon water levels, but accessible with the right gear in all but Spring run-off and rainy days. This approach is the most popular; approximately 90% of all Narrows hikers go to see the famous Wall Street section of the canyon, where towering walls are 1500 tall and the river is merely 22 feet wide. Suitable for most hikers, the Narrows Bottom-Up hike can be as much as a 10 mile round-trip, or as little as the 2 mile round-trip of the paved Riverside Walk. To see Wall Street, hikers must travel a minimum of 6 miles round-trip, 4 miles of which is in and along the Virgin River. But even a short hike into the river beyond the Riverside Walk is beautiful; for example, a ½-mile to Mystery Falls and back is a nice treat for young kids and less ambitious day hikers. When: Highly dependent upon water levels and road access to Chamberlain’s Ranch. In 2009-2011, the road was not accessible from November through late June. In 2012 through 2015, the road was accessible nearly every day of the year. 2018/2019 is expected to be a heavy snow year which could delay access to Chamberlain's Ranch until June. There is no reliable way to predict Top-Down access to The Narrows until about a month ahead of your estimated hiking date. This 17-mile day hike (or more casual overnight backpacking trip) is a great wilderness adventure and requires advance permits, which you can get from the Wilderness Desk at the Zion National Park Visitor's Center or online. The Park Service limits Overnight Narrows permits to 40 persons per day. This is a highly sought-after event and worth the effort, pre-trip planning and expense. Though not recommended as your first backpacking experience, it is breathtaking to spend the night in the canyon. Plan on using Restop® bags to carry out your poop. The Upper Narrows, 5 miles into your hike, is a spectacular foreshadowing of things to come. The junction with Deep Creek is a great place to have lunch and relax your feet before continuing to your campsite. (If you are hiking in a single day, this is your half-way point of the hike.) We have found taking your shoes and socks off, rinsing them, letting your feet relax for 15-20 minutes during the thru-hike is extremely rejuvenating. Don’t forget to look around! Day Two of the Overnight Narrows hike largely consists of the lower section of The Narrows, where you will find more hikers. Take your time enjoying a quiet morning in the canyon, as you'll be sharing the last few miles with many hikers exploring from the bottom-up. Seasonally the Narrows may close due to floods or snow melt. When the water is above 150 CFS the Park closes the narrows for up to 24 hours until is falls below 150 CFS. Kanarraville Falls Hike - a narrow slot canyon with mild, cold river flow, sometimes to waist deep. Very scenic, 1 hour drive from Springdale. Book a Half-Day or Full-Day Canyon Quest - may or may not have water, but a great challenge and accessible to anyone who likes adventure and seeing amazing places.